A cool new App from the makers of Flashlight ®. We've implemented the concept of a strobe light in a new and innovative way. Just swipe your finger on the screen, left or right, and the disco ball will start spinning while the iPhone 4's flashlight starts to strobe in sync. Swipe faster and the light will strobe faster. 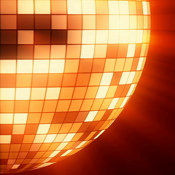 Click the lock icon on the bottom right if you wish to lock the strobe frequency and the disco ball and flashlight will keep on strobing at the same speed. This app specially goes out to the 150,000+ customers of our paid app Flashlight ®. Many of you asked for strobe functionality but we have not wanted to clutter the streamlined Flashlight ® interface or slow down the app loading time. We are keeping Flashlight ® separate because we believe it should remain fast and serve it's primary purpose, that of a flashlight! Disco Strobe is for all of you and besides, we think it's the very best (and funnest) Strobe Light App in the App Store Ever! If you love this App, please rate it in iTunes and add comments to help spread the word.